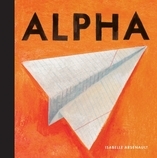 Discover the NATO phonetic alphabet—and find layers of connection in every letter—in a stunning abecedarian from celebrated artist Isabelle Arsenault. 64 / 9" x 9"
Isabelle Arsenault is the acclaimed illustrator of Jane, the Fox, and Me, winner of the Governor General's Award for Children's Illustration, and numerous other picture books. She lives in Quebec.